They display their produce in much the same manner today at outdoor stores. 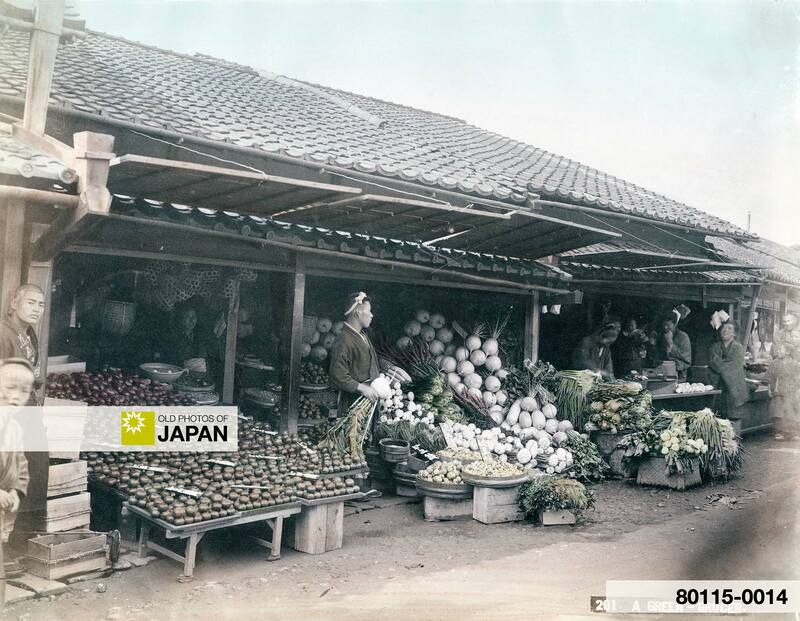 The owner of a vegetable store is holding a very large kabu (蕪, turnip). He appears to specialize in apples though, considering the large number that are displayed. Burdock, radishes, mustard leaf and onions can be seen in front of him. Panels on the eaves are cleverly used to protect the produce from the sunlight. The Japanese diet during the Meiji Period consisted of rice, small quantities of vegetables, especially pickled, fish and beans. In the country, people often ate barley, millet, or another cheap grain instead of the more expensive rice. But this popularity didn’t last very long. During the start of the 20th century, many people returned to a more traditional Japanese diet. It would take many years before these Western imports were finally accepted. Although meat officially was not a part of the Japanese diet due to centuries of buddhist influence, venison was available in the countryside as yama-kujira (mountain whale). Fish was after all allowed, and whale were seen as fish. So by calling venison whale meat, consumption was safe. 1 Chamberlain, Basil Hall (1905). Things Japanese Being Notes on Various Subjects Connected with Japan for the Use of Travellers and Others. J. Murray: 180. You can also licence this image online: 80115-0014 @ MeijiShowa.com.